I really, really, really hope this is the last time I find myself writing at 2:30am for at least a few days…. or weeks would be better! Today started at 830am (3rd morning in a row?) 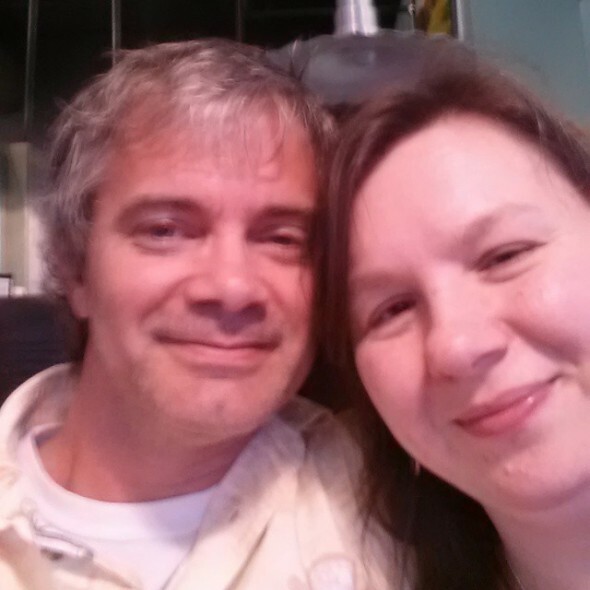 with my husband/alarm waking me up – except this time he was home, not calling from work! I piddled a bit and finally made my way into the kitchen just before 9am and immediately started cake work. No, I didn’t eat breakfast or check email or do anything else … I had so much to do and no time to waste. First, I added a final touch to a Minnie Mouse cake that was going out today along with boxing up the coordinating cake pops and then I had to make the matching candy apples. They were light pink… like these! Have you gals (or guys) ever heard of The Bathing Ape? That was the theme for the groom’s cake… Daniel (the groom) loves that brand of clothing so he asked for the brand logo on his cake. I was totally clueless until the bride sent me a picture, but it turned out really well! I think it was around 11:30am when I finished it up. Okay – so now the wedding cake. 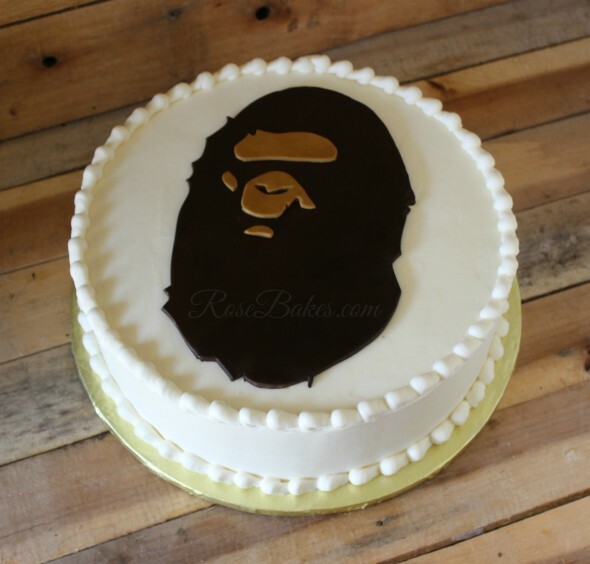 I was so torn about this cake. On one hand, I was dying to do it as soon as the bride sent me a pic. It was gorgeous and unusual and beautiful and well… it was calling my name. On the other hand – I was terrified! 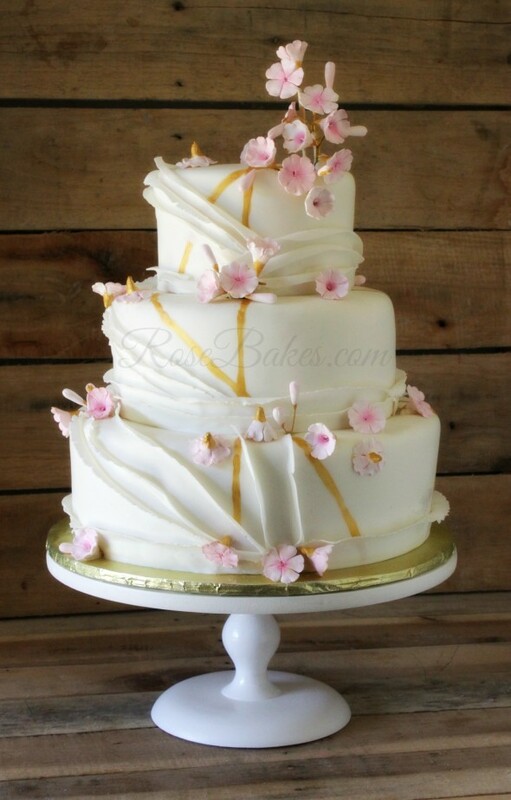 It was inspired by this Maggie Austin cake and Maggie’s fondant ribbons/ruffles are so delicate and paper thin and just… WOW in every sense of the word. I wasn’t sure I could get anywhere near that look! As soon as I stopped nit-picking, I took a quick shower, dried my hair and we loaded up to deliver the wedding & groom’s cakes. We left home around 3:30pm. The kids asked to tag along but we decided to have a little alone time and boy, oh boy was it nice!! We delivered and set up the cakes around 4:20, I took a few pictures at the venue (including the one above) and then I realized I was starving!! We initially planned to buy supper and take it home and surprise the kids, but then we decided we’d go out to eat instead (just the two of us) and take Little Caesar’s home for the kids. It was a much needed “break”… and we really enjoyed it! I don’t often hand out marriage advice, but I believe it’s very important for couples to have focused alone time. As our kids get older, we’re getting to do that more often and the time together is so good for keeping the spark in our marriage! But apparently we’re out of practice on the whole “selfies” trend… every pic we took was a mess! Haha! Unfortunately while we were out to dinner, I got a phone call that one of my Dad’s close friends had a motorcycle accident. His wife was killed in the accident and he was in the emergency room then hospital with possible internal injuries. While I’m not close with them and had only met her a couple of times, I’ve known the man most of my life and it just broke my heart. I immediately began praying for him and their families and well, I held Richy’s hand a little tighter the rest of the day. They were out doing something they loved together and in an instant she was gone. Don’t take the people in your life for granted… none of us are promised tomorrow! I should’ve immediately started on my last cake for the weekend, but I really just wanted to sit. So I did. I wasn’t feeling great and just a little while later, my heart went crazy and I started feeling really sick. I got a migraine, then nauseous, and I was just shaking and sweating and couldn’t catch my breath and ugh… I felt horrible. My heart hadn’t raced like that since I got the diagnosis and started the heart meds, so it really caught me off guard. I took an extra dose of meds and continued to sit on the couch and try to get my heart settled down. It took much longer than I had hoped. In the meantime Caleb filled and frosted the cakes for me and got them chilling and Richy colored the fondant for me. I’m always grateful for a husband and kids who can help me!! Since I was just sitting around, I tried to catch up on email and Facebook (I didn’t actually get caught up, but I made progress). 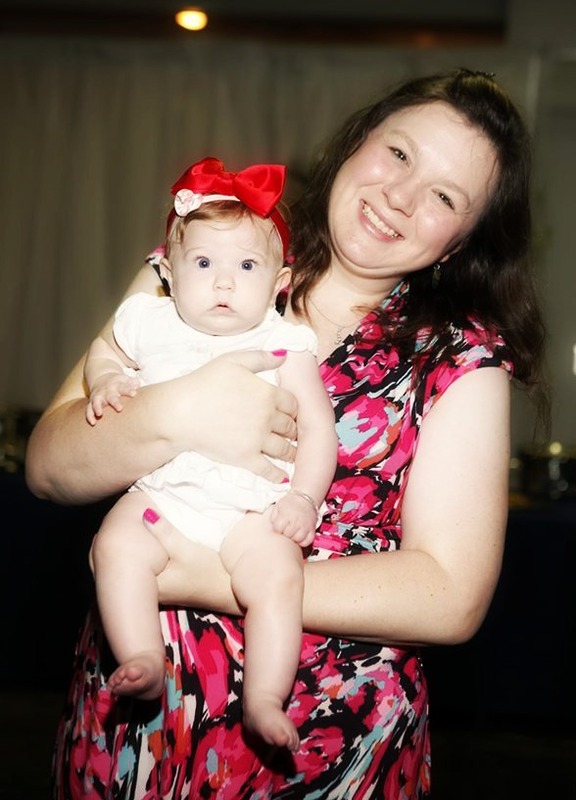 Anyway, my point was that my friend Angela shared this picture of me with my niece Perry at a wedding a few weeks ago … it just made me smile!! Around 10:30pm I was finally feeling normal again so I got up and started decorating the cake. It took 4 long hours. I tell people that I can decorate most any cake in 4 hours or less and this one hit the max mark for me. Maybe I can share a picture tomorrow night, but when I finished up about 45 minutes ago, there was no way I was setting up lights to take a pic! I guess if there’s an up side to staying up half the night doing cake it’s that I wouldn’t have been sleeping anyway. I have insomnia 2-3 times per month and I can say with certainty that I wouldn’t have been sleeping tonight… my heart is heavy for my Dad’s friend and after my “episode” with my heart, I was just not in a sleeping state of mind. Plus, there’s a thunderstorm going on outside and while I love to sleep when it’s raining, I also like to listen! So, at 3:15am… goodnight. I’m finally starting to feel like my eyes are heavy so I’m gonna try to sleep. I don’t know what your diagnosis is, but I had a similar problem with a racing heart; when it starting to fly, I had a hard time breathing, got severe headaches, and was totally worn out physically. After waaay too many years on meds (nearly 20), I had a heart ablation. In-patient procedure. Problem solved. No more meds. No more episodes. Just a thought to tuck into the back of your head for when life gives you more time to consider it. 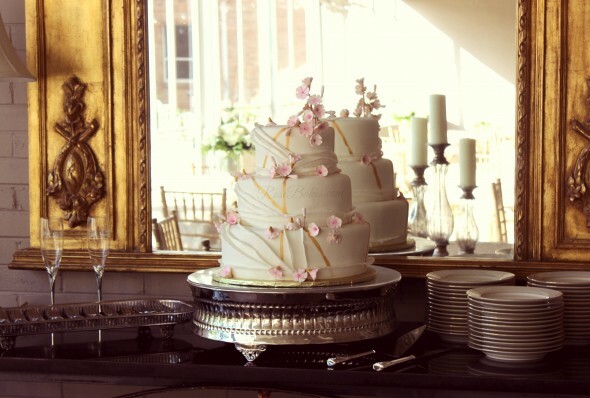 The wedding cake is stunning! Awesome job! I honestly can’t remember the name of what’s wrong with my heart, but it’s an eletrical issue that makes it race almost all of the time – sometimes worse than others. The doc said it’s not life-threatening, but rather a nuisance issue. I’ve heard of the surgery but the doc didn’t offer it as a possibility. I go back in a few months and I may ask about it. Thank you for your sweet compliments! Sounds real similar – my diagnosis was SVT (supra ventricular tachycardia). My cardiologist sent me to see an electrocardiologist who then did the ablation. He did 5 burns on faulty electrical circuits on my heart, blocking the electrical impulses from going down the wrong track and causing the racing pulse. One circuit he was unable to burn because it was too close to the correct path, and I am still doing fine. It’s been over 4 years since the procedure and I’ve been off all meds nearly 4 years with exactly zero episodes. I am so sorry to hear about the friends of your Dad. Someone I know and her husband were in a motorcycle accident (about a month ago). They both sustained serious injuries and surgeries. Sounds like they will both be OK, but it will be a long recovery. They also were out doing something they love. Glad your family was able to help with the cakes and you finally got some sleep! Hi Rose, I hope that you are feeling better. I’m very sorry about your dad’s friend and his wife. THe wedding cake looks amazing. I had to comment because in Ireland, where I am from, piddling is slang for urinating. It is a term usually used by small children. I presume that isn’t what you mean when you said you ‘piddled a bit’.